For lovely fashionistas, nothing matches the pleasure of including chic styles into their wardrobe. Isn’t that true? While talking about contemporary fashion, there are limitless options in western wear. But you can evolve your style and take it notches higher with the elegance of ethnic couture. In fact, you can discover the most astounding style statement in a fashion realm where east meets west with all aplomb. Here, we are referring to Indo western styles that are creating waves in global fashion industry. These fashionable dresses are ethnic in their soul and modern in their appeal. So, what are you waiting for? Explore the varieties that are ready to sway your mind with the intriguing merger of both worlds. Capture the picture perfect moments in this stylish Indo western dress. A lovely crop top with cape sleeve is beautifully complementing the stylish dhoti style wrap skirt. Indian ethnic tones are added to this outfit with intricate hand embroidery of beads and threads. Its bluish hues are perfect for imminent summers and comfortable fabrics will maintain your style meter with comfort. It looks straight from a fairy tale. 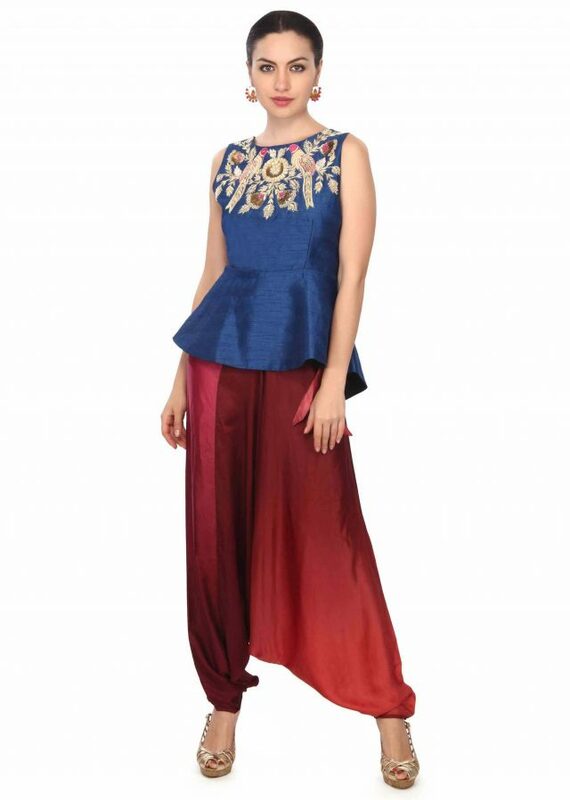 A deep red Aladdin salwar matched with a navy blue peplum top. A combination perfect for any occasion! This stunning outfit is created from raw silk and satin crepe. Its Indian style is accentuated with the beautiful peacock motif embellished with sequin and zardozi work. Be summer ready with this cool piece of fashion! It reflects a perfect merger of western style with Indian ethnicity. 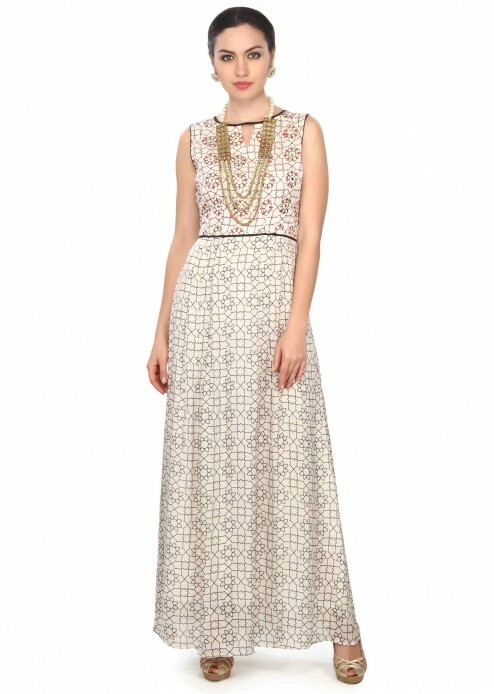 This off white floor-length dress can make you a show stopper for the most happening events and office parties. Created from silk, this outfit has a lovely black print and resham work. It is matched perfectly with a beaded neckpiece and pearl studs. Want a princess look for a party? This dress is your best answer. It has all the lovely elements of a fusion wear. 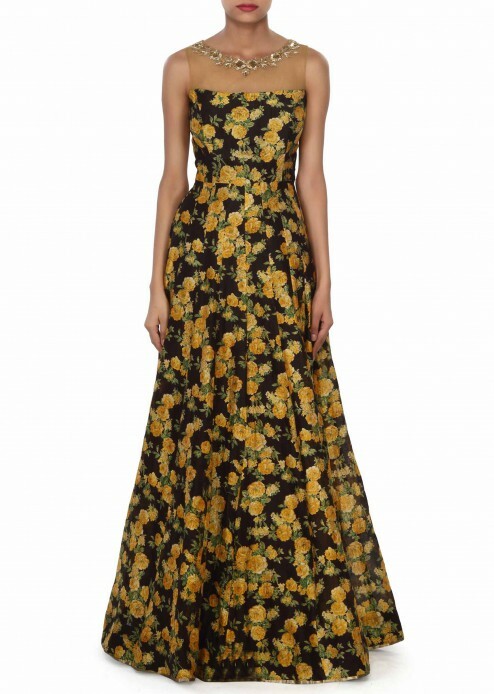 A pretty color (read black), stunning floral print, classy fabric (Cotton), and zardozi embellished neckline. A perfect recipe for the prettiest woman on the block! Its net yoke with embellished pattern is creating an illusion of a lovely necklace adding to the charm of this dress. A look to fall for! Indian couture can be best described in the tones of red color resonant with the richness of its traditions. The same ethos is crafted beautifully into this stunning coral red gown with western cuts and Indian touches. This halter neck gown is designed with fine kundan and zardozi design in a vivid floral motif. It is designed in net fabric for a graceful fall to the entire dress. Loved the pretty pearls and beads design at the helm! Be a diva in these stunning Indo western dresses. They are designed by the talented couturiers offering you a delightful blend of elegance and style.